Marketers are constantly trying to figure out how to reach their target audiences. They are faced with challenging questions. What is the right strategy? What is the right message? What is the right communication channel? There are many different theories out there, and every campaign is unique, but one thing is certain: Social media must be a part of your marketing strategy. The amount of people using social media has grown tremendously, and it is now one of the best ways to reach consumers. Social media is used for communication, photo-sharing, shopping, information-finding, and much more. It seems obvious to include social media in your marketing efforts, but it can be challenging to figure out exactly how to do that. So what’s the answer? Location is the answer. The amount of social data is massive, and marketers need a way to mine that data. Traditionally, marketers would search hashtags and keywords to see what is being said about their brand. This strategy today just won’t work. People are using location tags, emojis, and ambiguous phrases instead of the common keywords you’re looking for. Geofeedia found that 74% of location-tagged posts don’t include your keyword or hashtag (see more shocking stats in our eBook below). Using location data is the key to making social media data actionable and more effective than only using traditional keyword strategies. Up to 70% of consumers share their locations, and consumers tag more than 480 million social posts with location each month. 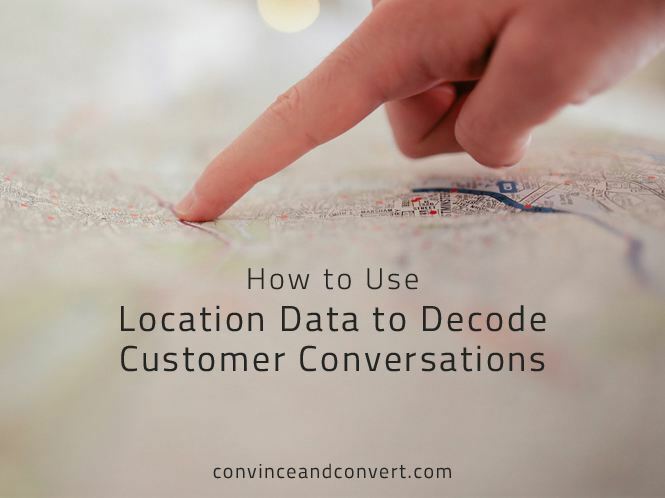 Location data is powerful, and you can use it to enhance your marketing strategies. Customer service, event marketing, and targeted advertising are three top areas where location-data can be extremely powerful. Consumers are not shy about sharing their feelings, whether they are positive or negative. Social media is a popular channel for consumers to post those reviews, comments, or complaints. Location can make that data actionable. Retailers can find customers that are posting in-store and immediately address issues. Marketing teams can implement “surprise and delight” campaigns by knowing exactly where a customer is shopping. See how the Mall of America uses location data to enhance their marketing strategies in this case study. People will be talking about your brand in various places, but during an event, it is especially important to understand what is being said at specific event locations. Discovering social content at the venue can help marketers find user-generated content to share, analyze event sentiment, and identify any safety or security threats. During major sporting events, user conferences (like Salesforce’s Dreamforce—see how the team used Geofeedia), store openings, concerts, and more, find the social content that is most relevant to your event and monitor accordingly. See how the NCAA uses location data to monitor tournament games in this case study. Location data provides valuable data for advertising strategies. Social content can be aggregated from specific places of interest for your brand, and audiences can be identified from these locations. Knowing where your customers or potential customers spend their time can help you optimize your targeting strategy. Implement campaigns based on location, and use tailored messaging to reach specific users. See how Sports World Chicago used location data to strategically target Cubs fans during the 2015 post-season run. Location-based social media data is powerful. Any marketer can find value in the information and use it to enhance many aspects of marketing campaigns. Don’t just rely on keywords and hashtags when location-tagged content can be much more actionable. Understand what your customers are saying in locations that matter. Check out our eBook below for four specific recommendations on how to implement the strategies explained above.